The passage of the Eighteenth Amendment in 1919 and The Volstead Act in 1920 effectively turned the United States of America into a dry nation. The consumption, production, and sale of intoxicating beverages (specifically alcohol) were prohibited by law. 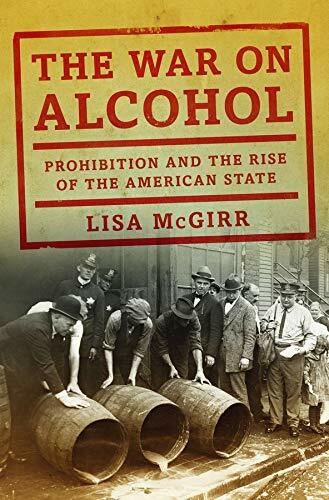 As Lisa McGirr illustrates in The War on Alcohol: Prohibition and The Rise of The American State, Prohibition and women’s suffrage rode hand in hand on a wave of populist progressive sentiment. Deriding alcohol’s deleterious effects, from domestic battery to taking away much needed worker income, suffragettes and temperance groups found common footing. Elite Protestants also found a means to curtail working-class political power via the homosocial venue of the neighborhood saloon. Passage of the Eighteenth Amendment occurred due in part to the progressive spirit and renewed patriotism created during the First World War. It was a noble experiment that would make America a better place. Like many noble experiments and acts legislating morality, the sarcastic and cynical would say that nothing bad ever happened again. History proved otherwise. The documentary series Ken Burns: Prohibition and HBO’s Boardwalk Empire retell an already familiar historical narrative. The Eighteenth Amendment was nothing more than a one-time aberration on the American legal landscape when puritans and prudes strong-armed Congress in passing a law that legislated morality. Colorful gangsters and spirited flappers populate the simplistic story any student of American history already knows by heart. The War on Alcohol is Ms. McGirr’s revisionist appraisal of this popular story. Her research and interpretive work is magisterial in design and execution. The counter-narrative constructed presents itself as an origin story for an intrusive and coercive federal bureaucracy. Prohibition laid the groundwork for the War on Drugs and the American prison-industrial complex. She also explains how Prohibition and the federal law enforcement apparatus bridged the Progressive and New Deal eras. The War on Alcohol retells the story of Prohibition with a cocktail of case studies, legal analysis, and a broad scope. Like the current War on Drugs, selective enforcement targeted minorities and the poor. The poor, using home still production to eke out economic survival, got slapped with heavy fines or were killed by overeager, trigger-happy Prohibition agents. Meanwhile, the wealthy had police and political connections, allowing them to keep their horde of illegal liquor and entertain their guests. The selective enforcement also involved a darker side, as McGirr chronicles the use of vigilante justice to aid the Prohibition agents. Aid sometimes came in the form of the Ku Klux Klan, an organization that wielded violence to assert its depraved philosophy of white supremacist Protestant hegemony. The night riders weren’t above consuming alcohol from the houses they raided, proving yet again that those seeking to make America great again were nothing more than thuggish moral hypocrites. President Herbert Hoover, aghast the scofflaw attitude, rampant violence, and overworked court system, sought to wage war against criminality. He did it through the creation of the Wickersham Commission, a government body that used the latest social science methods to enumerate and analyze crime in America. For the first time, the federal government used data as a means of social control. While Prohibition ended as a spectacular failure, it lived on in the revitalized Bureau of Investigation under another man named Hoover. The moral outrage over alcohol transferred to narcotic substances. The prohibitionist, interventionist, and militarist attitude manifested in Prohibition enforcement found new footing in the War on Drugs. Like the War on Alcohol, moral outrage became a means to fund vast prison and law enforcement bureaucracies. It also became used as a justification for trampling constitutional and human rights. But McGirr is careful not to create a specifically conservative partisan counter-narrative asserting that government is bad under all circumstances. With the onset of the Great Depression, Americans vehemently opposed the Eighteenth Amendment, but simultaneously clamored for aid from the federal government. But the New Deal and the rise of Franklin Delano Roosevelt could have never occurred without Prohibition’s effects on realigning the political landscape. Wet sentiment among the ethnic urban working class represented a wellspring of resentment the Democratic Party tapped in 1928. That year Al Smith, the Irish Catholic mayor of New York City, ran as the Democratic nominee for President. He didn’t succeed, but his campaign created an alliance between the ethnic working class and a business savvy middle-class. The Great Depression further cemented this alliance, allowing FDR to capitalize on the growing resentment against what was seen as a lily-white Republican Party. The genius of political campaigning is spotting new alignments and actually capitalizing on them. Anger and resentment alone won’t do that. The War on Alcohol is a revisionist history, an intellectual reassessment of the noble experiment. Unlike the Ken Burns documentary aimed at a general audience and going down like an amber ale, The War on Alcohol is written in more academic-oriented prose. Bracing and strong like a perfect martini, the book offers complementary insights to the Ken Burns documentary. With micro-distilleries coming back in vogue, The War on Alcohol provides a compelling look into why it has taken so long for local distilleries to bounce back from the long, dark shadow of Prohibition.